These guys were a HUGE hit with the entire family! I got my recipe from Fabulously Delicious and we will definitely be making them again! 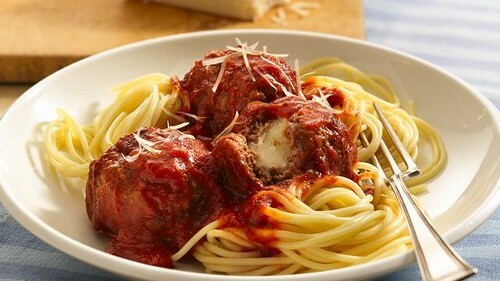 I ate some of the extra meatballs the next day for lunch with a little sauce to dip them in. YUM! 1. In a large bowl, combine turkey and all other ingredients except string cheese. Mix well to combine (use your hands to get the best results!). 2. Spray a large baking sheet with cooking spray (or each cup of a muffin tin, if using). Take 1/4 cup of meat mixture and roll into a ball. Press your finger into the center to make an indent, and place a piece of string cheese into it. Roll meat mixture again to cover the cheese completely and make a meatball shape. Place meatballs onto baking sheet or into muffin pan. Bake for 30 minutes or until cooked through and cheese starts to ooze out. Remember, in this case, ooze is a good thing! Cook them too long and the cheese will start to harden and not be melty. Serve immediately.